Are you in need of some daily inspiration? Do you love to learn about the saints? 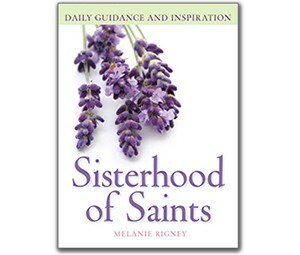 If you answered “yes” to either of those questions, then Sisterhood of Saints by Melanie Rigney (Franciscan Media, 2013) is a book you will want to keep close by. For each day of the year, Rigney offers a short biography of the featured saint, a quote of inspiration from either the Scriptures or the saint, and a challenge to help you live your spiritual life more deeply. Rigney has highlighted the big-name women saints. Those looking for Mary, Therese, Elizabeth, Brigid, Catherine, Kateri, etcetera will not be disappointed, but one is especially impressed by the number of lesser-known saints who are featured in these pages. The reader will have the opportunity to make many new heavenly friends, such as Rita Amada de Jesus, Anna Wang, Giuseppina Gabriella Bonino, and Celine Borzecka. There is a saint in heaven for every woman to relate to and seek help from. The Sisterhood of Saints would make a wonderful gift for the Catholic women in your life. It is also a wonderful resource for oneself, to deepen one’s faith and learn more about the communion of saints. Previous ArticleTime to Make “Unborn” the New Gay?